You can easily customize the form for a SharePoint list by opening PowerApps in a browser. You don't need to write traditional code, such as C#, or download another app, such as InfoPath. When you publish your changes, the form is embedded within the SharePoint list for use by all of its users. In PowerApps, you can also review analytics reports, easily create conditional formatting, and connect to other data sources. To follow the steps in this topic, you'll create a simple list so that you can see how customization works, and then you can apply the same concepts to your own list. If the Customize forms option isn't available or doesn't work correctly for your list, it might contain data types that PowerApps doesn't support. Also, you can't move your form to a different list or environment. In the command bar, select PowerApps, and then select Customize form. PowerApps Studio opens in the same browser tab. If the Welcome to PowerApps Studio dialog box opens, select Skip. Drag the Availability field to the bottom of the list of fields. The fields appear in the order that you specify. Hover over the Attachments field, select the ellipsis (...) that appears, and then select Remove. The field that you specify disappears from the form. You can configure the Price, Availability, and Colors fields to appear only if Details is set to yes. In the left navigation bar, expand Details_DataCard1, and note the numeral that appears at the end of DataCardValue. While holding down the Alt key, select the Details toggle (by clicking or tapping it) multiple times. The three fields that you configured appear and disappear from the form. Open the File menu, select Save, and then select Publish to SharePoint twice. In the upper-left corner, select the back arrow, and then select Back to SharePoint. Open your list, select New in the command bar, and then select Customize near the top of the form. Change its size, orientation, or both (for example, to make the form wider). Customize one or more cards (for example, change a card's display text or input control). More information: Understand SharePoint forms integration. From your list in SharePoint, open the settings page (by selecting the gear icon near the upper-right corner), and then select List settings. Under General settings, select Form settings. On the Form Settings page, select one of these options, and then select OK.
Use the default SharePoint form - When a user opens your list and selects New in the command bar, the default form for the list will appear. You can toggle back and forth between options, as needed. 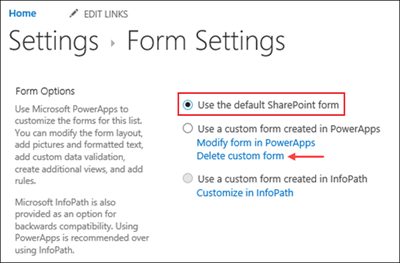 On the Form Settings page, select Use the default SharePoint form, and then select Delete custom form. Q: How does a customized form differ from a standalone app that I create from SharePoint or PowerApps? A: If you customize the form for a SharePoint list, the form doesn't appear as an app in PowerApps Studio or PowerApps Mobile. You can open the form only from the list for which you created it. Q: When should I customize a form to manage data in a SharePoint list, and when should I create a standalone app? A: Customize a form if you want your users to manage data without leaving SharePoint (for example, in a desktop browser). Create an app if you want your users to manage data outside of SharePoint (for example, on a mobile device). Q: Can I customize a form and create an app for the same list? Q: Can I customize a list and create an app using the same features? Q: Can I customize a form in an environment other than the default environment in my organization? Q: How can I easily share my form with others? A: Open the form, select Copy link, and then send the link to anyone whom you want to use the form. Q: Can I update my form without making my changes visible to others? A: Yes. You can change your form and save as many times as you want, but your changes won't be visible to anyone else unless you select Publish to SharePoint twice. Q: If I customize a list form and make a mistake, can I revert to a previous version? Open your list, select PowerApps on the command bar, and then select Customize forms. In PowerApps Studio, select File, and then select See all versions. The Versions page opens in a new browser tab. If you don't see the See all versions button, select Save. The button should appear. Go back to the Versions page in the other browser tab, locate the version that you want to restore, and then select Restore. If you get an error message saying that the restore failed because the form is locked by another user, wait until the user unlocks the form, and then try again. Q: Can I move my form from one list to another? Q: How do I share my form? A: You don't need to share the form—the form inherits permissions from the SharePoint list. When you're done customizing it, just publish it back to SharePoint so that others can use it. Q: Who can customize forms? A: Anyone with SharePoint permissions to manage, design, or edit the associated list. Q: Do I need a PowerApps license to create or use custom list forms? A: You need an Office 365 plan that includes PowerApps. Q: What happens when guest users access a list that has a custom form? A: Guest users get an error message if they try to access a list form that's been customized using PowerApps. Q: As an administrator, how do I get a list of all customized forms in my organization? In the PowerApps admin center, select the default environment for your organization from the list of environments. At the top of the default environment page, select Resources. 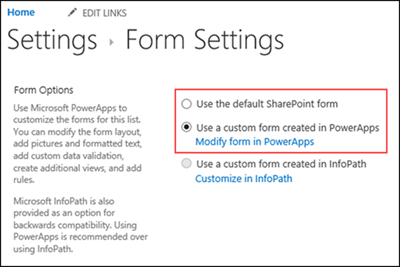 From the list of apps, look for apps with a SharePoint Form app type—these are the customized forms.